You will be paying for the full price of the trip up front. *This is the Total for the trip due today. SKU: 8HOURTRIP. Categories: Book Your Guided Fishing Trip, Guided Fly Fishing Trip. Tags: colorado fly fishing, fishing in colorado, float tube fishing, fly fishing colorado, how to fly fish. 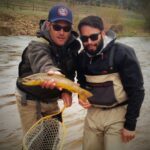 Purchase A Fishing LicenseDon’t cut your fly fishing adventure in Colorado short, with a full day of fly fishing, the possibilities are endless! Kirk’s offers 8 hour Colorado fly fishing trips in the heart of Rocky Mountain National Park. Our professional flyfishing guide will take you to a location where the fish are abundant and the people are scarce. Hiking may be necessary, but it will be well worth it in the end! Rod and waders included. Hearty lunch and drink included. All Trips include: all necessary fly fishing gear, transportation to and from the shop and a friendly, knowledgeable guide. Trips include a hearty lunch! All Rod/Reels, Waders and flies are provided FREE of charge.